Two hands (and napkins) required here. That’s what it takes to get a hold of this beefy BBQ brisket and coleslaw-filled sandwich dripping with sauce. Cut half the onion into thin slices; place in large bowl. Add cabbage; mix lightly. Mix dressing and 2 Tbsp. barbecue sauce until blended. Add to cabbage mixture; toss to coat. Refrigerate until ready to use. Heat oil in large skillet on medium heat. Add meat; cook 5 min. or until evenly browned on both sides, turning after 3 min. Transfer to 13x9-inch baking dish sprayed with cooking spray. Chop remaining onion piece; sprinkle over meat. Mix broth, 1/2 cup of the remaining barbecue sauce and garlic; pour over meat. Cover. Bake 2-1/2 to 3 hours or until meat is done (160ºF). Remove from heat. Let stand 10 min. Shred meat; place in large bowl. Add remaining barbecue sauce; toss to coat. Fill each roll with 1/2 cup meat mixture and 1/3 cup coleslaw just before serving. For more flavor, prepare shredded meat mixture ahead of time. Cool, then refrigerate until ready to serve. 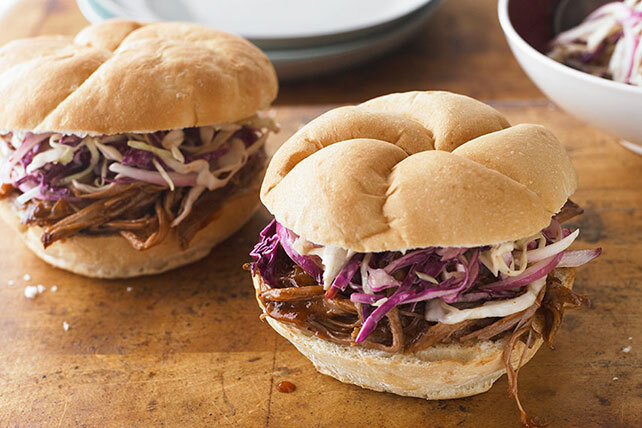 Reheat, then spoon onto bottom halves of rolls; top with coleslaw and top halves of rolls.